At ABF Remodeling, we specialize in granite countertops for your kitchen or bathroom.With virtually an unlimited choice of colors to choose from, we are certain that we have a granite countertop solution for your home. Whether you’re looking to revamp your own kitchen or affordably upgrade to granite countertops in a rental property, we carry a huge inventory granite countertops to provide great selection as well as great pricing. We invite you to come into our 4000 square foot showroom and browse our huge selection of fine granite countertops options. We pride ourselves on providing quality materials, expert craftsmanship, and the best customer service in the industry. We can help you choose the look that best suits your lifestyle, personality, and budget. We offer an extensive selection of the most beautiful and durable granite countertops They are resistant to heat, scratches, and stains. They also provide protection against mold and mildew and come in a myriad of patterns. New granite countertops are a great way to freshen up your space and make your kitchen feel brand new again. We look forward to helping you create the ideal kitchen or bathroom space in your home with new granite countertop installation. 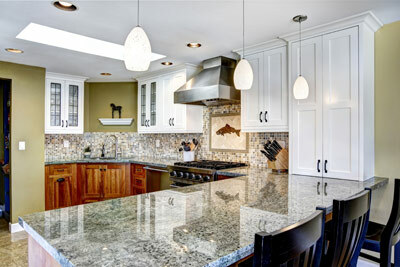 One thing people love about granite is its ability to match virtually any color scheme. 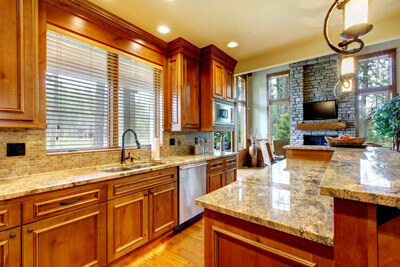 Granite countertops present several advantages over traditional wood or laminate countertops. They add an organic look to any room. Because countertops are a central part of any home, we want to help you get the space-enhancing look you desire. You can rely on us to provide first-class hassle-free granite countertop installation. Wow your guests with the elegance of new granite countertops and love your kitchen again. Can’t find the right color granite? Are the other stores out of stock? We’re sure to have the right color countertops you’re seeking in stock and conveniently for your new project. If we don’t have your color option in stock, we can tour our granite yard to find exactly what you are looking for. Granite countertops stand up to knife marks, heat, and other normal wear and tear. Depending on the day, your kitchen countertop may end up being used as a cutting board, hot pad, office desk, snack bar, food prep service, or drink prep station. Granite countertops guarantee a sturdy surface that can stand up to the abuse you dole out. Speak to a member of our staff to schedule the design and installation of your new countertops today. Call us at 281-855-3400 and let us create countertops that will last a lifetime, or fill out the information below and one of our design consultants will contact you as soon as possible.